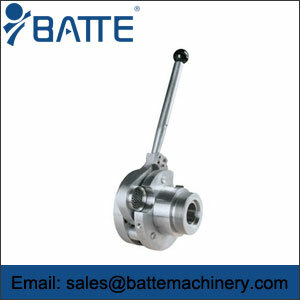 Net,changer,prevent,adverse,ef - Batte Machinery Zhengzhou Co,.Ltd. Plastic extruder (filter) is a composed of one or more filter automatic switching device, used for during the plasticizing material flows through the filter material is contained in particles and impurities filtered out. Filter by a metal porous plate or wire mesh support, porous plate or metal silk screen is installed on the carrier of the filter, carrier within a system driven by hydraulic cylinder hydraulic working position and offline non-work position switch between. Old-fashioned plastic extruder filter is fixed in a porous or groove on the protection of the board, so that we can make extruder filter and mould formed between seal. Clean filter pressure generated by the small, perhaps only 50 ~ 100 lb/in2. With the increase of working time, on the intercept of the impurity in the material and particle number is more, thereby blocking the filter screen. Screens change for recycling process clogged filters work to a certain extent when extrusion pressure pattern in the body will increase material flow is unable to continue to work. Requires downtime replacement block at this moment, when manually replace clogged filters, pressure suddenly drops, the temperature of the molten material may also decline, resulting in the size of the products change. 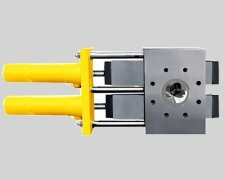 In order to maintain the product of the same size, the original is to use adjustment screw speed of extruder, or adjust the linear speed of extruder. When extrusion round products, these changes may not cause serious problems, but in the extrusion flat or irregular shape of the products, plastic melt temperature changes may affect the appearance of product size. For example, in a flat mould, cooler molten material may make sheet center slants thin, and make the peripheral partial thick. Use the old filter will affect the machining cost of some products, some rigid polyvinyl chloride (PVC) processors do not use the filter, is the cause of polyvinyl chloride (PVC) easy to decompose, especially contact with steel and copper are more likely to break down at high temperature decomposition temperature (200 degrees). Filter can make PVC plastic melt temperature and prone to degradation, so you need to thermal stability and better materials, thus increasing the cost of materials. If use PVC special screen changer, also increase my cost. So most rigid polyvinyl chloride (PVC) processors or avoid using filter, or use of the coarse filtration unit converter, filtering only larger particles of impurities. They have thus become namely into the product quality is not high, the low extra value of the appearance quality is not stable, reduce the profits of PVC finished products. 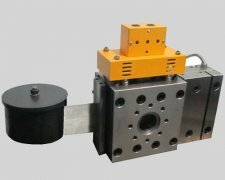 Existing production in network device adopts hydraulic fast automatic principle to replace the network. 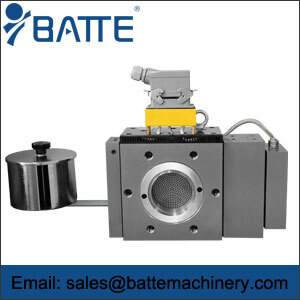 Adopts hydraulic automatic network, double plate net changer, new net changer and new type pulse washing net net changer and a series of net changer completely solved the material produced by extrusion machine downtime of net voltage instability caused by irregular situation of finished product. Especially suitable for granulation, pipe, plate, sheet, EPE, EPS, pearl cotton, XPS extruded plate, PVB riot membrane, hollow plate, crowded Seine, BOPET/BOPP chemical fiber length of fiber. Used in wire drawing (monofilament, flat wire, wire nets) products, etc. Secondly because use automatic fast changing network principle in network technology, mesh easy clean, simple replacement screen without a lot of congestion, when the material to replace the network pressure, material flow, feed temperature more smooth transition, completely solve the high temperature filters make PVC plastic melt temperature and prone to degradation phenomenon, solved the PVC manufacturers concern.